About 80 to 90 percent of our vitamin D comes from sun exposure. The problem is [many of us] assume if you have a healthy diet that you're getting enough of every nutrient. Even the best dietary sources of vitamin D aren't loaded with the nutrient: a serving of salmon is a good bet, with around 450 International Units (IU) of vitamin D per three ounces. But there are just 137 IUs per serving of fortified OJ and around 120 in fortified milk.The Institutes of Medicine recommend most children and adults under age 70 get 600 IUs of vitamin D daily, and those over 70 should aim for 800. Without enough sunlight and dietary D, children may be at greater risk for rickets, a softening of the bones, and adults may be at greater risk for osteoporosis. Vitamin D deficiency may also up risk of high blood pressure and type 2 diabetes. So what should you watch for if you're concerned you might not get enough? Here are a few signs you might need more vitamin D.
Especially during the dry season, [vitamin D deficient] adults feel more achiness in bones and muscles, and joints are a little more stiff when they get up in the morning. Vitamin D seems to improve levels of the neurotransmitter serotonin, which in turn could lift your spirits. In a small 1998 study, healthy people given vitamin D supplements during the cold season reported greater positive feelings than people given no D. However, a larger study in women over 70 found no significant mental health benefit. The skin simply doesn't make as much vitamin D as you get older, and the kidneys start to grow a little less productive when it comes to converting that D into the form the body puts to good use. There's no change in vitamin D production in people carrying excess weight, but the higher concentration of body fat affects the levels of vitamin D in the blood. That's because vitamin D is fat soluble, meaning the more body fat you have, the more it gets "diluted. 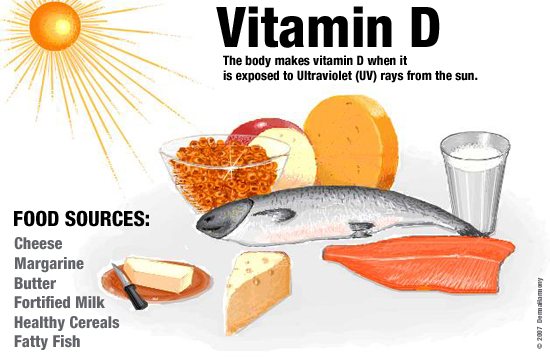 People who are overweight or obese may require more daily vitamin D to make up for this effect. Studies have shown distinct demographic differences in rates of vitamin D insufficiency and deficiency. Your skin pigment is natural sunscreen. A sunscreen with 30 SPF reduces the skin's ability to make vitamin D by a whopping 97 percent. Someone with very dark skin needs up to 10 times the amount of sun exposure than someone with a very pale complexion to make the same amount of vitamin D.
People with Crohn's, celiac or inflammatory bowel disease may be a greater risk for vitamin D deficiency because of the way these gastrointestinal conditions affect fat absorption. With these and other stomach issues, fat absorption can be lower, but that in turn lowers absorption of fat-soluble vitamins like D.
So how can you get your D safely? Sensible sun exposure is key, since D production only occurs on unprotected skin. If you know you're likely to get a mild sunburn after 30 minutes outside without sunscreen, venture out for about 10 to 15 minutes and then put your sun protection on. Expose arms, legs, abdomen and back if you can, for max vitamin D production. And keep in mind depending on where you live, you may only make vitamin D for part of the year due to the angle of the sun, and likely only from about 10 a.m. to 3 p.m. for the same reasons.